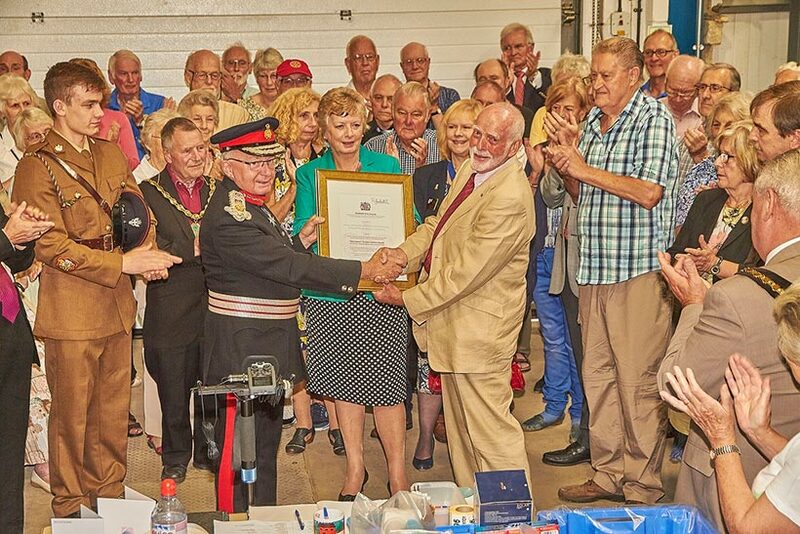 Aquabox has been formally presented with the Queen's Award for Voluntary Service 2016 by the Lord Lieutenant of Derbyshire, William Tucker. Also in attendance were Mrs Elizabeth Fothergill the High Sheriff of Derbyshire, Patrick McLoughlin MP for Derbyshire Dales, Eve Conway President of RIBI, Colin Gell Rotary 1220 District Governor, Dr Roger Summers Past District Governor, David Haspel President of Wirksworth Rotary Club, the Chairs of Derbyshire County Council and Derbyshire Dales District Council, the Mayors of Wirksworth and Matlock and a host of the loyal volunteers who give up their time and work so hard each week. Presenting the Queen's Award the Lord Lieutenant said “You join today a fairly small and very select and special group of people and organisations within this county who have been recognised for this fantastic award and I offer each and every one of you my richest congratulations.” He praised the highly efficient and professional manner in which over 100,000 boxes have been sent to more than 50 countries in the last 25 years, covering almost every natural disaster and helping hundreds of thousands of people. The Lord Lieutenant went on to express his thanks to David Walker, who unfortunately could not attend, as it was David who originally nominated Aquabox and took the time to fill in the nomination form, and presented David Rawson with the commemorative piece of glassware for the award. Mike Tomlinson, the Aquabox Chair of Trustees, paid tribute to all the helpers who give up their time without any pay and who do everything that is deserving of this fabulous accolade. He stressed that this award is not just for the volunteers who pack the boxes or assemble the filters, but also for all the people who knit toys, blankets and jumpers and collect and donate baby and children’s clothing. If you'd like to support our ongoing humanitarian work please donate today.